This article is part of a series on the use of Marc and Mentat. Because Marc can solve such a large set of physics, the number of things that can go wrong is pretty large. In this first article we’ll be looking at convergence problems and how to overcome them. Note that this is what is needed to solve, not what’s needed for correct answers. For non-linear analysis further problems creep in, resulting in a lot more that can (and often does) go wrong. One of the most common problems is non-convergence of models: The FEA (Finite Element Analysis) solver keeps on iterating. It does not converge in the allowed number of iterations. It then tries a smaller step. No convergence again. This repeats until either the load change is so small that the solver reaches a minimum step and stop or the user gets bored and kill the run. With more than ten years of experience debugging non-linear models (my own models and those of clients), I have found that the number one reason for convergence problems is that there is something wrong with the question you’re asking from the solver. Some critical bit of physics is not included in the model. This may be a missing constraint, contact that is not included, friction that is excluded or a yield-curve that is unstable. Typical reactions to models that does not converge are to decrease the minimum step-size allowed or else to loosen the convergence tolerances. The former increases runtime while still not converging. The latter reduces the accuracy significantly while not addressing the underlying problem(s). Next, the User tries to allow the solver more iterations in an attempt to help convergence. This sometimes works, sometimes not at all. Contact settings are changed. Material settings are changed. Constraints are changed. As can be imagined, this approach of randomly trying stuff in order to get the model to run is very inefficient. Especially since the problem in all likelihood was missing physics. In this post, we’ll discuss some causes of non-convergence. More importantly, we’ll discuss ways to systematically approach debugging of non-linear Finite Element models. While some of this is generic to any FEA code, the brunt of this article is on debugging Marc models. In nonlinear analysis, we usually increase the applied load “slowly”. For each load-step attempted (an increment) the solver will iterate until convergence criteria are met. At this point the results will be written and the next step attempted. A smaller load increment is usually significantly closer to linear which results in easier convergence. Note that contact is one possible exception to this rule, but we’ll discuss it later. In Marc / Mentat, any load has the option to be scaled as a function of “time”, using a “table”. If you’re not familiar with “time” or “tables” in Marc, please read the relevant section in the Mar101 training material which is part of the standard documentation for Marc / Mentat. If the user chooses NOT to link a table to a load, a very nasty problem can creep in: Depending on the load-stepping scheme (adaptive vs. Fixed-step), the solver may assume you want to apply the load in one step. Let’s assume some load is too large to apply in a single step. The solver does not converge when it attempts to apply the load in one step. It reduces the time-step. If the solver thinks you want to apply the load immediately (because you did not specify a table), the full load is applied again with the smaller time-step. This is NOT a solver problem: The user has chosen to specify the load in a very ambiguous way, so the solver is allowed to interpret it as it sees fit. Linking a table that defines the load-scale-factor as a function of time completely removes the ambiguity. There is no possibility of Marc misunderstanding how your load is applied. In short, ALWAYS use a table with every load specified for Marc. Doing so may add 30 seconds to model setup-time, but will save you days of debugging time. The convergence criteria can be based on absolute values or relative values. Relative values tend to be more meaningful since the allowed “error” scales with the applied load. In engineering terms: If the maximum load is 1N, a 10N unbalanced load is unacceptable. On the other hand, if the maximum load is 1MN, a 10N unbalanced load is pretty accurate. 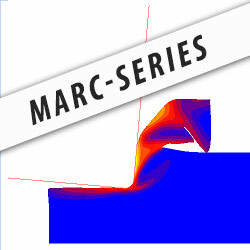 We tend to ignore the “Energy” criterion for a simple reason: Marc allows combining Displacement- and Residual-convergence, but not combining Energy convergence with anything else. If the applied load perfectly balances, the reaction forces can be zero. Since relative residual checking divides by the reaction force, we again end with a case of zero divided by zero. In other words, the model may be converged even if one of the criteria says otherwise. This is because the criterion in question is not a valid check for that special case. It is pretty easy to spot these: Look at the log file. It reports the convergence values and the ratios. The example below shows the info in the log file for one of its iterations. Unimportant lines for this example are shown in blue. The “cycle number” is the iteration number. “Recycled” means that it did not converge and that another iteration (recycle) will be performed. In this example, the convergence ratios were 0.001 for both residual checking and displacement checking. For residual checking, the “residual force” is divided by the “reaction force”, resulting in the “residual convergence ratio”. The residual is therefore converged. For displacement checking, the “displacement change” (i.e. the change in displacement from the previous iteration to the current) is divided by the “displacement increment” (i.e. the total change in displacement for all the iterations of this load-step) to obtain the “displacement convergence ratio". This example is not converged yet. If either the “max reaction force” or “max displacement increment” was close to zero, it would indicate that either that criterion is invalid or that there is no load yet on the model. Contact / Friction that is not yet in equilibrium – some part of the model is still “sliding” into its correct location. Please note that the default tolerance for Marc is really coarse at “0.1” (or 10%). For residual checking, this would say “if the unbalance load at any node is within 10% of the maximum reaction force, treat the result as converged.” Ouch! Please only use the defaults to verify a model (load-sequences are correct etc.). Ensure that your choice of tolerance(s) is much tighter than the defaults if you want reasonable results. This will make convergence harder to obtain, but only because it does not hide the real reason for non-convergence. Ideally use “residual AND displacement” checking unless one of the two is not valid for some (explainable) reason. Furthermore, don’t ever change any settings in a model which does not converge before taking a look at the convergence values and rations in the log file. This will show at which node the worst unbalanced load is, in which direction the worst unbalance is, whether the displacement or residual checking is valid for the increment in question and which convergence criterion is the furthest from convergence. This should give a clue as to what the problem may be. Contact and friction typically has two possible effects: It can drastically increase the number of iterations needed for convergence and/or it can cause convergence to become impossible. The increase in iterations is due to the extreme non-linearity inherent in contact (zero stiffness if no contact, infinite stiffness when in contact) and needing to find out exactly which nodes are in contact. A component “constrained” to another component only via contact, with a load applied that is large enough to cause separation between the bodies does not have a static solution: After separation, the load will cause one body to accelerate which requires a transient solution. A similar component that touches another, but without friction, may not be able to withstand loads in all directions without friction. Even if friction is allowed, it will only have a valid solution until sliding start. This occurs when the change is displacement between iterations is so large that the contact behaviour is invalid. It then scales the displacement change down to a more reasonable value (0.18 of the intended increment in the example above). This is seldom a contact problem as it tends to indicate that the model either has no or a very low stiffness in some direction. A detailed look at contact is a topic for a different post. Change all contact to “glued” to see if the model now converges. This is to see if the non-convergence is due to contact. This is a very powerful debugging tool: It will write partial un-converged results to the results file if requested. Only displacements, reaction force and contact results are available for these. To activate it, switch on the “iterative results” on the results form in Mentat. Just remember to switch if off once your model is working – it will increase the results file size by an order of magnitude if left on. If you do not follow a structured approach to resolving non-convergence, it becomes a hit-or-miss affair. Mostly miss unfortunately. After running the model for a few iterations, kill the model and have a look at the iterative results. This usually gives clues to the cause of the problem. The convergence values and convergence rates found in the log file is also useful tool to debug non-convergence. Using such a structured approach can reduce the time required to debug a model significantly. Very helpful post! Hope you can talk the contact problems in more details. Hi Gerrit, very clearly explained and helpful article, that helped actually debugging one of my models, as highlighted that the friction can be quite crucial in reaching the equilibrium. It wasn't done in Marc, but the concept itself throughout your post I think can be easily applied to any FE application. Thanks again!